A traditional Finnish folk cure, which recommends applying a mixture of spruce tree resin and unsalted butter to wounds, has proved better than a modern colloid polymer at healing severe pressure ulcers. Ulcers healed within six months in 93% of the resin group, compared with just 44% of the control group, but the superior effects of the resin salve only became apparent after three months of treatment. (Beneficial effect of resin salve in treatment of severe pressure ulcers: a prospective, randomized and controlled multicentre trial. Br J Dermatol. 2008 May;158(5):1055-62). A German study has assessed the costs and cost-effectiveness of additional acupuncture treatment in patients with headache. The randomized controlled trial of 3182 patients measured quality of life, cost differences between treatment groups, and the incremental cost-effectiveness ratio (ICER) of acupuncture treatment. The ICER was calculated as 11657 Euros per QALY (quality-adjusted life year) gained. According to international cost-effectiveness threshold values, this makes acupuncture a cost-effective treatment in patients with primary headache. (Cost-effectiveness of acupuncture treatment in patients with headache. Cephalalgia. 2008 Apr;28(4):334-45). Another German studied the clinical effectiveness and cost-effectiveness of acupuncture in patients with dysmenorrhea. In a randomized controlled trial plus non-randomized cohort, patients with dysmenorrhea were randomized to 15 sessions of acupuncture over three months or to a control group (no acupuncture). All subjects were allowed to receive usual medical care. Of 649 women, 201 were randomized. Those who declined randomization received acupuncture treatment. After three months, the average pain intensity was lower with acupuncture than without (3.1 vs. 5.4). The authors concluded that additional acupuncture in patients with dysmenorrhea was associated with improvements in pain and quality of life as compared to usual care alone and was cost-effective within usual thresholds (overall ICER 3,011 Euros per QALY). (Acupuncture in patients with dysmenorrhea: a randomized study on clinical effectiveness and cost-effectiveness in usual care. Am J Obstet Gynecol. 2008 Feb;198(2):166.e1-8). A positive response to acupuncture by migraine sufferers is associated with beneficial changes in the regulation of the autonomic nervous system. Thirty migraineurs were randomly allocated to two groups receiving either true acupuncture (TA) or sham acupuncture (SA) treatment. Across the combined TA and SA groups, clinical responders (those with at least 50% reduction of migraine attacks) exhibited a decrease of the low-frequency band of heart-rate variability (an index of cardiac autonomic control) in the course of the treatment, which was not be observed in patients without clinical benefit. Both TA and SA therefore seem to have benefits on the autonomic nervous system in migraineurs. (Acupuncture in migraine: investigation of autonomic effects. Clin J Pain. 2008 Feb;24(2):106-15). Researchers reported at the 234th National meeting of the American Chemical Society that paraplatin killed 6 times more human ovarian cancer cells when they were pre treated with a cranberry juice extract. Platinum drugs, including cisplatin, paraplatin and oxaliplatinum are recommended for colon and ovarian cancer chemotherapy. Cancer cells tend to develop resistance to platinum therapy and higher doses of the drugs can cause nerve and kidney damage. Chlorpyrifos, an organophosphate pesticide which is the world’s leading insecticide in volume terms, is linked to clear reductions in male fertility. A by-product of the chemical suppresses male testosterone. Chlorpyrifos has been subject to strict controls in the USA since the year 2000, but is licensed for both garden and agricultural use by the European Union and is widely used in the UK. (Epidemiology 2006; 17 (1): 61-68)..
ARE IVF EMBRYOS STARVED OF A VITAL INGREDIENT? The lack of natural growth factors in the fluid in which IVF embryos are grown could have lifelong effects on people conceived in this way, suggests Australian researchers. Babies conceived by IVF or ICSI are more likely to have a low birth weight and die soon after birth (New Scientist Oct 23, 2004, p. 10). Growth media have been developed by trial and error, and contain only a few amino acids and other nutrients. At the University of Adelaide, research with mouse embryos suggest that a growth factor called GM-CSF, which is also found in humans, improves birth weight and growth after birth. When this factor was absent, mice at adulthood were fatter and the males had smaller brains. Presently, five drugs for Alzheimer’s disease are heavily marketed to consumer and doctors. In a study of eight databases and bibliographies to identify all randomized controlled trials, the conclusion was that none of them improved symptoms or delayed progression of the disease. A study of over 76,000 Danish women found that, contrary to previous study results, there was no association between smoking in pregnancy and congenital birth malformations. However, there was a 60% greater risk of birth malformation among mothers who used nicotine replacement therapy during pregnancy, and double the risk of musculoskeletal malformations. (Obstetrics & Gynecology 2006;107:51-57). Newer drugs are not any better for migraine prevention than older treatments: “There’s no proof of increased efficacy with the newer drugs”, according to Dr. Gretchen Tietjen, chair of the department of neurology at the University of Toledo. Amitriptyline (Elavil) and propranolol (Inderal) seem to be just as effective as the much more expensive divalproex sodium (Depakote) and topiramate (Topamax). High levels of arsenic have been found in rice bran from China and Bangladesh and in manufactured rice bran food products from Japan and the United States. Rice tends to absorb heavy metals from the area where it is grown and concentrates it in the outer bran layer. As a result, brown rice will be more contaminated than white rice. Daily intake of vitamin C in sufficient strength appears to reduce the frequency of colds although it does not affect their severity or duration. Cannabis medication (Sativex) taken over a period of five weeks can significantly improve pain on movement, pain at rest and quality of sleep, and can reduce inflammation in people with arthritis, according to a new study. Side effects were mild or moderate and there was no evidence of withdrawal symptoms at the end of the study. The largest study to date into the effects of healing prayer by strangers has found no benefits. Around 1800 patients at six US hospitals, all recovering from coronary bypass surgery, were randomly divided into three groups. The first group was told they might or might not be prayed for, and in fact were. The second group was told they might or might not be prayed for, and in fact were not. And the third group were prayed for after being told they definitely would be. The outcome showed that there was no benefit in terms of complications deriving from actual intercessionary prayer, with the disturbing finding that the group who definitely knew they were being prayed for had more complications than the other groups. It is suggested this might be because of the additional stress caused by thinking their condition was serious enough to be prayed for. The study cost $2.5 million and has given rise to calls to abandon further studies into this form of healing prayer. (Benson H et al. Study of the Therapeutic Effects of Intercessory Prayer (STEP) in cardiac bypass patients: A multicenter randomized trial of uncertainty and certainty of receiving intercessory prayer. American Heart Journal (2006) 151; 4: 934-942, 06; 332: 696-700). A major premise of Chinese, Tibetan, Sufi, Balinese and African medicines is that thoughts are real, and they have real effects on the functioning of the body and on health. Gradually this concept has become acceptable to Western medical practitioners. “Thinking”, in traditional Chinese medicine, falls within the areas of influence of both the digestive system and the heart. This explains one mechanism by which feelings and thoughts can affect our digestive and cardiovascular health, and also how imbalances in these territories can rebound to affect our thoughts in turn. As a consequence, Oriental medical medicine places great importance upon taking responsibility for the nature and subject matter of our thoughts. Tibetan practice is highly developed in this area, providing many styles and levels of teaching to achieve both insight and mastery over the mental realm. The common thread among all of these variations is the emphasis upon learning to direct the mind’s attention away from thoughts which cause suffering, and towards thoughts that relieve suffering. Tibetan doctors (as well as practitioners in many other systems) realized that to a great degree, we are what we think about. If our minds are filled with worried, fearful, or angry images, our thoughts will become worried, fearful, and angry. Our habit of mind will become increasingly concentrated on these negative emotions, and we will become worried, fearful and angry people. It is also relevant to consider how much of our thinking is dependent on who we listen to. If the voices around us are fearful, worried, or angry, then this is what we will think about. The energies of these afflictive emotions will change the flow of qi in our bodies and will tend to imbalance our health. Although acupuncture and other techniques are effective to counteract the effects of these negative thoughts and emotions, the best practice is to prevent these imbalances from developing. This requires that we limit or eliminate negative influences around us to as great a degree as possible. In recent months I have observed an increase in worry, fear, and anger among patients and the general public as a direct result of overexposure to negative messages from the print and visual media. Widespread even before the recent financial “crisis“, these recent events provide an excellent example of how people are told what to think and feel in order to exploit their emotions and behavior. A mind filled with fear and anger is less capable of rational problem solving, and is easier to manipulate. It is in the interest of powerful media moguls and the conglomerates they direct to focus their readers and viewers into fearful and dependent states of mind. Politicians are also enamored of utilizing these techniques of propaganda to deflect attention from their own deficiencies as well as their role in creating the very problems that they then subsequently exploit. The simple solution is to stop reading and listening to all mass market sources of propaganda. Although a difficult habit to break for those who are constantly watching or listening to the “news”, it is the only way to limit the negative voices and influences from these sources. There is little downside to pursuing this response. It is evident that with very few exceptions, the people who are featured by mass media sources are not capable of providing any insights or solutions to the problems that they address. 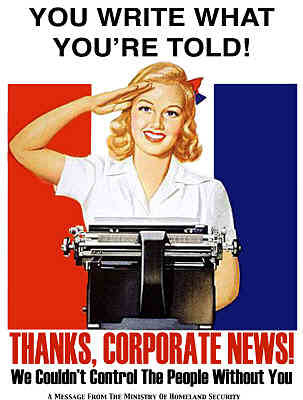 In most cases, journalists are interviewing other journalists who have no knowledge or experience in the subject at hand, other than their capability to repeat whatever lies or propaganda are displayed on their teleprompter. 24 hour coverage has created an ever-ready corps of talking heads who babble whatever nonsense they or their handlers believe in, or can create, to generate a sense of urgency for the viewer or listener to “stay tuned” in order to be kept “informed” of the “latest developments”. Almost nothing of what appears in the average “news” paper or television show is news, and subtle or obvious bias is always detectable. Also lacking in credibility are the various “celebrities” and political operatives who present their limited and shallow perspectives on the latest controversy or outrage. Academics and “former government officials” are always a good source of propaganda, as their very light work schedule provides lots of free time to sit around television studios or dictate articles according to the demands of the mass media. Anger and fear in America is reaching monumental proportions as a result of continuous onslaught by media propagandists. Increased stress levels, unhealthy behaviors, and disease causing imbalances are the fruits of these efforts. High levels of fear, worry, and anger also contribute to interpersonal conflict within families and between co-workers, with resultant degeneration of character, decreased civility and courteousness, and an explosion of poor judgment and heartlessness. Ultimately, incorporating positive voices and thoughts are part of the meditative path to mental health and well being. But, the first and most important step is to turn off your televisions and stop listening to the “nattering nabobs of negativity”. Unless you have fish to wrap, or a pet parrot, ending your subscriptions to print media will also save trees, reduce global warming and garbage production, and safeguard your mental and physical health. You will also discover that you have freed time to pursue activities of real benefit.